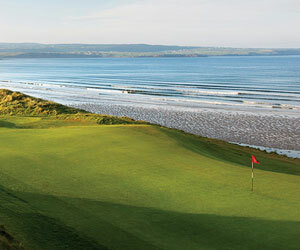 This famous royal golf club in Northern Ireland was founded in 1888. 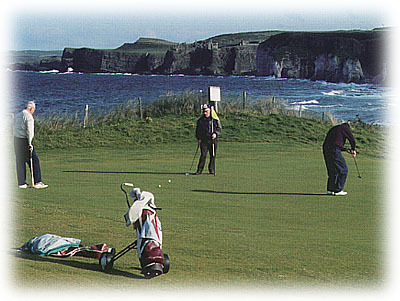 It is overlooked by the 13th century Dunluce Castle, and the championship course is named after this ruin. It is complimented with another course, the Valley, that is less demanding but full-length. This club is the only club in Ireland and Northern Ireland to have hosted the British Open, and is on many's short list of top Irish courses to visit. Portrush coastal road .8 km. Club, trolley and caddie hire available. Practice and full catering facilities. Named after the 13th century ruins, this is as fine a links course as you will find anywhere. This course also offers a stiff and great challenge. the Dunluce links at Royal Portrush is an outst\nding test of golf, with great scenery and a course in tremendous condition it would be hard to find a better course. It is a very fair links with even greater potential than what it has already achieved. I was fortunate enough to play Royal Portrush and visit the Dunluce Coast this August. It is a truly great golf course that is tough but fair. A caddy is very helpful, and I found the staff to be friendly and helpful. The course gets a lot of play but the greens were just outstanding. If you are able to visit this area, make sure you play this course at least one time. One of the finest links courses in the world. A perfect pleasure starting from the first hole, which is, bar none, the best opening hole I have ever seen: When you play Portrush, have a look from the championship tee down toward the fairway, about 200 yards away, with OB right and left. Now imagine there's a gallery of a couple of hundred knowledgeable golfers watching you, in perfect silence... If you hit the ball dead straight, and never, never, go into the rough, Portrush is pretty easy. Every hole is beautiful, every one unique. Ireland is full of beautiful links courses, each with at least a few great holes. Portrush has 18 in a row. Don't miss it. Played here on a lovely day in 9/98, and thought it was one of the top three courses in Ireland, along with Royal County Down and Ballybunion (with Waterville a close fourth). Harder than it first appears, it opens with an unremarkable couple of holes, but by the time you reach the par-4 5th, the scenery and golfing challenges are spectacular. The fifth is awesome, requiring an accurate tee shot to land in the narrow fairway, followed by an uphill 8 or 9-iron to a green that literally falls off a sheer cliff. Long is gone. Curving, undulating fairways are often indistinguishable from the rough when viewed from the tee, so a caddy is helpful. in all, definitely worth the trip. Truly one of the greatest courses in the world. One should be prepared for a very difficult golf course with many holes requiring long and accurate drives, difficult approaches and devilish putting-especially in the high winds which seem to prevail. The hospitality is excellent--would highly recommend but is not for the faint of heart. Number 4and 5 are spectacular holes as well as Calamity #13. Not to be missed by a purist.